It’s last minute and you don’t want to go back to the store for an egg dying kit but your kids are begging to dye Easter Eggs. What do you do? 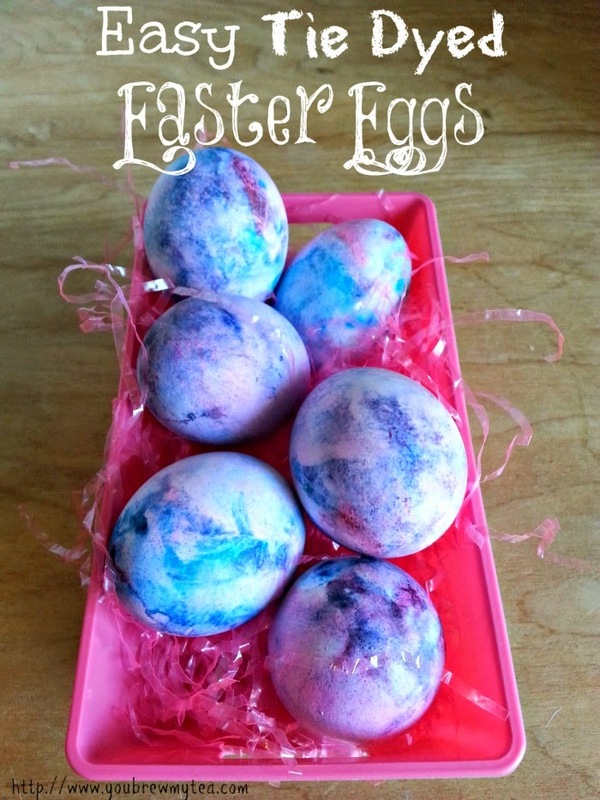 You make these Easy Tie Dyed Easter Eggs! I’ve seen this posted on various websites and Pinterest and for the life of me can’t find the originator of this so not sure who to give credit to for the idea, but am excited to say that shaving cream + food coloring + hard boiled eggs = fun messy success. Plastic or Latex Gloves to protect hands from dye. Squirt shaving cream onto a plate. If using shave gel you will need to use your hands, a spoon or other utensil to stir around until the foam cream develops. Drop food coloring randomly around the shave cream using alternating colors to create a random pattern. Use a toothpick, knife or other utensil to swirl food coloring around to create a fun pattern. Don’t over mix as you want it to still have unique colors. Put on your gloves to protect your hands from the dye at this point. If kids are participating make sure to put them in old t-shirts or smocks/aprons to prevent stains. Roll your eggs around in the shaving cream mixture until all sides are coated. Let sit for 10 minutes. Rinse off with cool water and pat dry. Not only is it a great fun activity to do with the kids it also is easy to do at the last minute for egg hunting on Easter weekend. Great for sensory development, lessons on how colors mixed together make new colors as well as a handy use for all of that shaving cream you got free if you are a couponer. We enjoyed making these last week and of course had to make some fun deviled eggs after we finished with the activity. While real eggs are fun to dye, make sure to always be mindful of their time out of the refrigerator when using them to hunt and then eat later. These are too cool! Thanks for sharing on Something To Talk About link party! Oh, we will be doing this one this year. These are so cool!! I can’t believe Easter is upon us already. If feels like I was just dying eggs yesterday.